US$ 2585 / person ? 9 Tang – Ura We will follow the ancient trail from Tang valley to Ura, which is traditionally also part of Bumthang district. The path with some views of snowy peaks, notably highest mountain of Bhutan Gangkhar Punesum will take us over the Shangey-la pass (3.800 m). Finally we will descend to the picturesque village of Ura. We will walk through the authentic village and visit rich and dominant village temple. After some rest pay a visit to the village and local temple. Evening program with dance and bonfire. 10 Ura – Jakar Morning drive to Membartso, so called "Burning lake" where Pema Lingpa, the saint of 15th century, discovered treasure of Buddhist scriptures. Continue drive to the Bepzur village and start hiking to Bepzur Chukpo's mansion. From here the ascending footpath will take you up to the ridge with comfortable gently ascending trail. Soon you’ll get uphill and get views of snowy peaks and surrounding hills including of many places you hiked few days back. After about 2.5 hours you should reach Pedseling Gompa, the remote monastery above the Jakar valley. Here also car with picnic lunch will be waiting. Finally we will reach to Bumthang brewery to see the processing of Bhutan's venerable Red Panda beer. We will taste some for sure too! At evening we can optionally visit to dance and karaoke bars to experience local culture. 11 Jakar – Paro (by flight) Taking domestic flight to Paro is extraordinary experience. You will see many of the seven and six thousand meters high mountains on the border with Tibet, including Gangkhar Punesum which counts as the highest mountain never summited by men. After landing in Paro, visit National museum and Paro dzong, castle where Bernardo Bertolucci’s Little Buddha film was shot. Explore the lively small town. 12 Paro Drive to castle-ruins of Drukyel dzong, from where you can see the top of holy Jomolhari mountain. Explore the calm Kyichu lhakhang which also pins down giant demoness body. Climb to Taktsang gomba (Tiger’s Nest), is the highlight of the tour. You can consider hiking in the morning or early afternoon depending on weather and preferences. After visiting the temple, climb further up to Zangto Pelri lhakhang another temple, offering bird’s eye views of Tigers Nest. 13 Paro Drive to Chele-la pass (3890m) which is the highest motorable pass in Bhutan. To the north you can see the holy peak of Jomolhari (7326m) and to the west even Kanchenjunga (8586m) in clear weather. Hike to 4000 meters high viewpoint will give you interesting high altitude experience. Before people did bring bodies of the deceased for sky funerals. Then descend down to Kila Gompa, the oldest nunnery in Bhutan, hiking through the ancient forest. You can actually hiking down all the way down to Paro or take a car and visit quite interesting Dzongdrakha monastery which is often equated to Tiger's Nest in it's beauty. Enjoy evening in leisure or make another last one stroll up to the Zuri Dzong for nice views of Paro airport and town. Enjoy the last evening in Bhutan! Extend with Gayzamchu hike (+1 day): When staying one more night in Ura, you can do Gayzamchuhike. Trail is around 10 kilometers long and leads over the 3800 meters high pass. Whole hike will take around 6-7 hours. After reaching the trail end, you can drive to Thrumshing-la pass (3750m) second highest motorable pass in Bhutan and also visit rhododendron park on the way with tens of different species of the tree which are endemic to the area. Consider the shorter variant (-2 day): If you discard Gayzamchu hike on day 9 and optional Paro hikes on day 12, you might shorten tour by two day and still enjoy a lot. 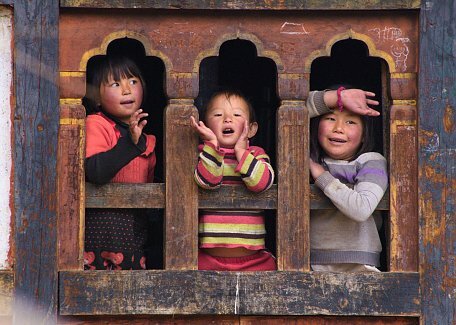 See Hiking Heart of Bhutan I, 12 days program for details.